Remains of Stone Aqueduct at Tyre. Remains in Cæsarea of Two Aqueducts. Palestine, in contradistinction to Egypt, was a land of natural waters rather than of irrigation (Deut. xi. 10, 11), and there can be little doubt that the aqueducts, like the roads of the country, were constructed mainly by the Romans after the fall of Jerusalem. In four instances, however—at Tyre, Jericho, Cæsarea, and Jerusalem—earlier aqueducts seem to have been constructed to increase and improve the water-supply of the cities, and, in the case of Jericho, to extend the cultivation of the palm-groves. 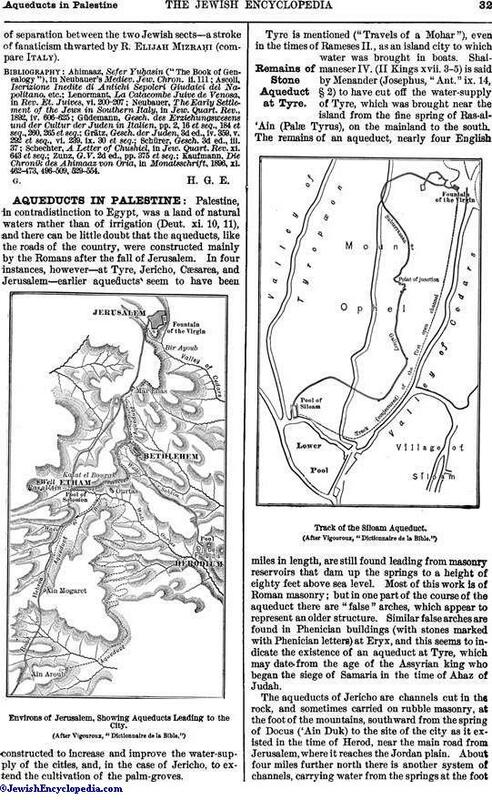 Environs of Jerusalem, Showing Aqueducts Leading to the city. (After Vigouroux, "Dictionnaire de la Bible. ")Remains of Stone Aqueduct at Tyre. Tyre is mentioned ("Travels of a Mohar"), even in the times of Rameses II., as an island city to which water was brought in boats. Shalmaneser IV. (II Kings xvii. 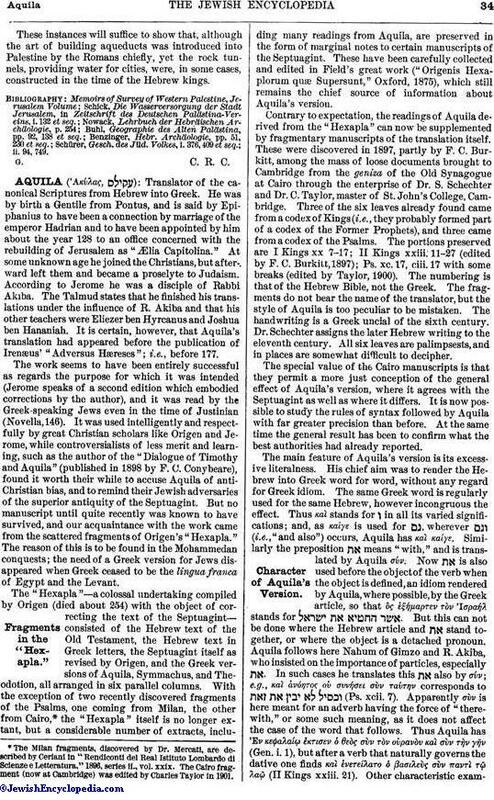 3-5) is said by Menander (Josephus, "Ant." ix. 14, § 2) to have cut off the water-supply of Tyre, which was brought near the island from the fine spring of Ras-al'Ain (Palæ Tyrus), on the mainland to the south. The remains of an aqueduct, nearly four English miles in length, are still found leading from masonry reservoirs that dam up the springs to a height of eighty feet above sea level. Most of this work is of Roman masonry; but in one part of the course of the aqueduct there are "false" arches, which appear to represent an older structure. Similar false arches are found in Phenician buildings (with stones marked with Phenician letters) at Eryx, and this seems to indicate the existence of an aqueduct at Tyre, which may date from the age of the Assyrian king who began the siege of Samaria in the time of Ahaz of Judah. Track of the Siloam Aqueduct. The aqueducts of Jericho are channels cut in the rock, and sometimes carried on rubble masonry, at the foot of the mountains, southward from the spring of Docus ('Ain Duk) to the site of the city as it existed in the time of Herod, near the main road from Jerusalem, where it reaches the Jordan plain. About four miles further north there is another system of channels, carrying water from the springs at the footof the mountains eastward into the Jordan plain, with branches which appear clearly to have been intended for irrigation. This answers to the system mentioned by Josephus ("Ant." xvii. 13, § 1), near the village of Neara (the ancient Naarath, Josh. xvi. 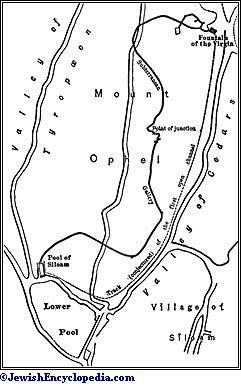 7), which was constructed by Archelaus to water his palm-groves, for Eusebius (in the "Onomasticon") places Neara five Roman miles north of Jericho. Cæsarea, the capital of Palestine under Herod the Great, was built on the seashore north of Joppa, on a site which had no good water-supply. It is, therefore, probable that aqueducts were built when the city was first founded. The two that are still traceable have a length of about four miles to the north, and conduct water from the spring of Mamas (an ancient "Maiuma," or place of water), near the Crocodile river. They are on different levels, and run on arches, which appear to be Roman work, across the swamps near the river. The low-level aqueduct is tunneled through the low sandy cliffs further south, and rock-cut well-staircases lead down to the channel at intervals. These aqueducts may have been repaired or rebuilt in the later Roman age, but the original rock channel is probably as old as the time of Herod. 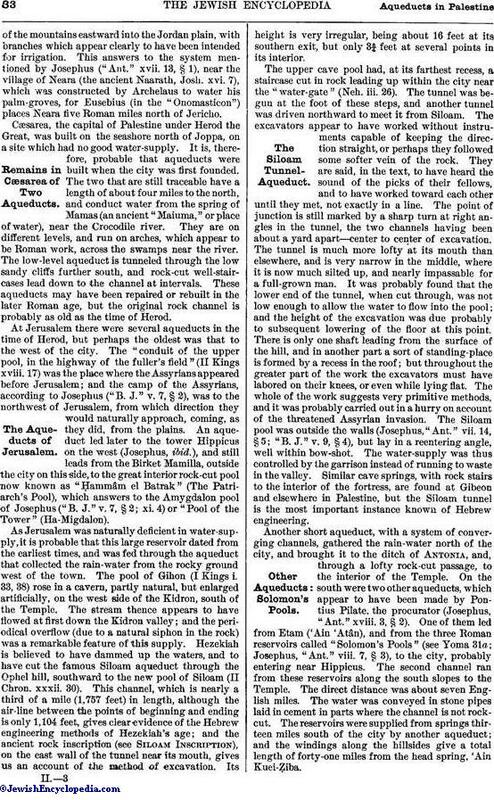 At Jerusalem there were several aqueducts in the time of Herod, but perhaps the oldest was that to the west of the city. The "conduit of the upper pool, in the highway of the fuller's field" (II Kings xviii. 17) was the place where the Assyrians appeared before Jerusalem; and the camp of the Assyrians, according to Josephus ("B. J." v. 7, § 2), was to the northwest of Jerusalem, from which direction they would naturally approach, coming, as they did, from the plains. An aqueduct led later to the tower Hippicus on the west (Josephus, ibid. 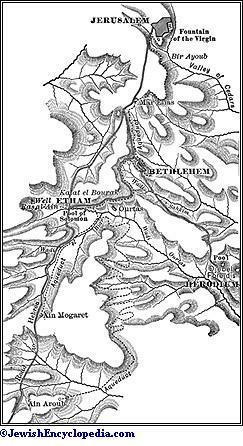 ), and still leads from the Birket Mamilla, outside the city on this side, to the great interior rock-cut pool now known as "Ḥammâm el Batrak" (The Patriarch's Pool), which answers to the Amygdalon pool of Josephus ("B. J." v. 7, § 2; xi. 4) or "Pool of the Tower" (Ha-Migdalon). As Jerusalem was naturally deficient in water-supply, it is probable that this large reservoir dated from the earliest times, and was fed through the aqueduct that collected the rain-water from the rocky ground west of the town. The pool of Gihon (I Kings i. 33, 38) rose in a cavern, partly natural, but enlarged artificially, on the west side of the Kidron, south of the Temple. The stream thence appears to have flowed at first down the Kidron valley; and the periodical overflow (due to a natural siphon in the rock) was a remarkable feature of this supply. Hezekiah is believed to have dammed up the waters, and to have cut the famous Siloam aqueduct through the Ophel hill, southward to the new pool of Siloam (II Chron. xxxii. 30). This channel, which is nearly a third of a mile (1,757 feet) in length, although the air-line between the points of beginning and ending is only 1,104 feet, gives clear evidence of the Hebrew engineering methods of Hezekiah's age; and the ancient rock inscription (see Siloam Inscription), on the east wall of the tunnel near its mouth, gives us an account of the method of excavation. Its height is very irregular, being about 16 feet at its southern exit, but only 3¾ feet at several points in its interior. The upper cave pool had, at its farthest recess, a staircase cut in rock leading up within the city near the "water-gate" (Neh. iii. 26). The tunnel was begun at the foot of these steps, and another tunnel was driven northward to meet it from Siloam. The excavators appear to have worked without instruments capable of keeping the direction straight, or perhaps they followed some softer vein of the rock. They are said, in the text, to have heard the sound of the picks of their fellows, and to have worked toward each other until they met, not exactly in a line. The point of junction is still marked by a sharp turn at right angles in the tunnel, the two channels having been about a yard apart—center to center of excavation. The tunnel is much more lofty at its mouth than elsewhere, and is very narrow in the middle, where it is now much silted up, and nearly impassable for a full-grown man. It was probably found that the lower end of the tunnel, when cut through, was not low enough to allow the water to flow into the pool; and the height of the excavation was due probably to subsequent lowering of the floor at this point. There is only one shaft leading from the surface of the hill, and in another part a sort of standing-place is formed by a recess in the roof; but throughout the greater part of the work the excavators must have labored on their knees, or even while lying flat. The whole of the work suggests very primitive methods, and it was probably carried out in a hurry on account of the threatened Assyrian invasion. The Siloam pool was outside the walls (Josephus, "Ant." vii. 14, § 5; "B. J." v. 9, § 4), but lay in a reentering angle, well within bow-shot. The water-supply was thus controlled by the garrison instead of running to waste in the valley. Similar cave springs, with rock stairs to the interior of the fortress, are found at Gibeon and elsewhere in Palestine, but the Siloam tunnel is the most important instance known of Hebrew engineering. Another short aqueduct, with a system of converging channels, gathered the rain-water north of the city, and brought it to the ditch of Antonia, and, through a lofty rock-cut passage, to the interior of the Temple. On the south were two other aqueducts, which appear to have been made by Pontius Pilate, the procurator (Josephus, "Ant." xviii. 3, § 2). One of them led from Etam ('Ain 'Atân), and from the three Roman reservoirs called "Solomon's Pools" (see Yoma 31a; Josephus, "Ant." viii. 7, § 3), to the city, probably entering near Hippicus. The second channel ran from these reservoirs along the south slopes to the Temple. The direct distance was about seven English miles. The water was conveyed in stone pipes laid in cement in parts where the channel is not rockcut. The reservoirs were supplied from springs thirteen miles south of the city by another aqueduct; and the windings along the hillsides give a total length of forty-one miles from the head spring, 'Ain Kuei-Ẓiba. These instances will suffice to show that, although the art of building aqueducts was introduced into Palestine by the Romans chiefly, yet the rock tunnels, providing water for cities, were, in some cases, constructed in the time of the Hebrew kings. Schürer, Gesch. des Jüd. Volkes, i. 376, 409 et seq. ; ii. 94, 749.